NHL News : Breaking: Nikita Kucherov has been suspended by the NHL. 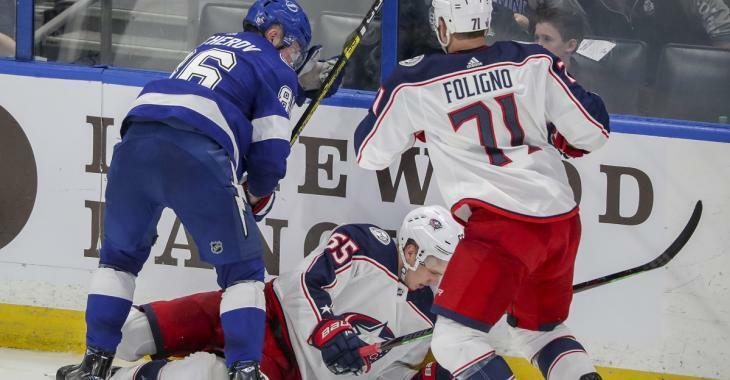 The Tampa Bay Lightning will be without arguably there top star for Game 3 of their first round playoff match up against the Columbus Blue Jackets in the Stanley Cup Playoffs. According to an official announcement from the National Hockey League's Department of Player Safety the league has made the decision to suspend Tampa Bay Lightning superstar Nikita Kucherov for 1 game following a rather dangerous hit delivered in Game 2 of the series. I have no doubts that the reaction to this decision will be mixed as there were those who felt that the game misconduct had been enough of a punishment, while others felt that the intent behind this hit merited a multiple game suspension. Kucherov of course got himself in trouble during Game 2 of the Lightning's first round series against the Columbus Blue Jackets, arguably the most shocking series of the 2019 Stanley Cup Playoffs thus far, when he tripped Blue Jackets defenseman Markus Nutivaara before delivering a rather predatory hit to the head of Nutivaara who at that point was playing the puck from his knees due to the earlier trip from Nutivaara. The hit itself was not delivered with a great deal of force but there was no question that the hit that followed drove Nutivaara's head dangerously into the boards and there's no question that it was delivered to a defenseless player. In it's ruling the National Hockey League was quick to emphasize the fact that the hit had not been delivered with a ton of force however they also added that this factor alone did not excuse Kucherov's actions. The league very clearly took issue with the fact that it was Kucherov himself who had put Nutivaara in a vulnerable position prior to taking advantage of that vulnerability. Additionally in their ruling the league cited the fact that this was a hit delivered late in a losing effort, during the Stanley Cup Playoffs no less, and felt that it was an attempt on the part of Kucherov to send a message for the next game in the series. As a result of all these factors the league felt that 1 playoff game, effectively 2 regular season games in the eyes of the NHL, was the appropriate punishment. For the full ruling check out the video below.